The declared thermal conductivity of Polyfoam Roofboard Extra is 0.033W/mK. Polyfoam Roofboard Extra is a rigid extruded polystyrene (XPS) board with a low Global Warming Potential (GWP) and zero ozone depletion potential (ODP). 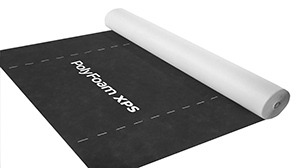 Polyfoam Roofboard Extra is a lightweight, lap jointed board with high compressive strength. ‎Polyfoam Slimline Zero Membrane is a high performance, thermally bonded tri-laminate of polypropylene; spunbonded (outer layers) and microporous (inner layer). Manufactured in the UK using a blowing agent with low global warming potential (GWP) and zero ozone depletion potential (ODP), Polyfoam XPS products are free from CFCs and HCFCs. They have product specific Environmental Product Declarations (EPDs) and raw material procurement is certified to BES 6001 (Responsible Sourcing of Construction Products). Polyfoam Roofboard Extra is non bio-degradable and 100% recyclable. The continuous service temperature limits of Polyfoam Roofboard Extra is up to +70º C.
Polyfoam Roofboard Extra is highly resistant to compression and withstands both occasional and long term static loads. The high compressive strength and rigidity of the product allows a range of ballast material including gravel, soil and concrete slabs to be used as part of the construction. Load bearing construction elements should be designed to adequately support the combination of imposed and dead loads without creating excessive deflection. Polyfoam Roofboard Extra has a water vapour resistivity of 625MNs/g.m when tested in accordance with BS EN 12086. Polyfoam Roofboard Extra has a moisture absorption of 0.6% by volume when tested in accordance with EN 12087. Polyfoam Roofboard Extra is lightweight and easy to handle and install. 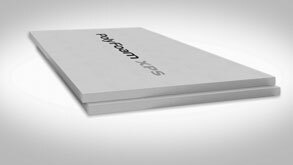 Polyfoam Roofboard Extra is supplied in four sided packaging designed to be easily recognised and is labelled with identifying product and manufacturing data. Ensure the product is not stored close to open flames or other ignition sources and avoid volatile organic compounds and chemicals such as solvents. Polyfoam Roofboard Extra should not be left exposed to prolonged sunlight as this will result in surface degradation. When outside storage for extended periods is required cover the products with opaque/light coloured sheeting. 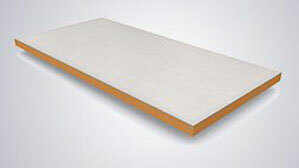 Polyfoam Roofboard Extra is supplied as a Lap Jointed Board with a 15mm overlap. In accordance with ETAG 031 the design thermal conductivity λD ≥ 100mm – 0.034W/mK < 100mm – 0.035W/mK.